I am on my way back home from another business trip. I spent the week at the Webby Award’s Webby Connect Conference listening to all that is new, exciting and the future of the Internet. It was held at the St. Regis Hotel in Dana Point. The hotel and conference were excellent and I am very glad I went. The conference covered a variety of topics and had many good speakers. The 3 keynote speakers included Arianna Huffington of the Huffington Post, Michael Eisner, former CEO of Disney and Vinton Cerf, one of the founding fathers of the Internet. I arrived early enough on the first day to get a swim in the ocean. It was great to be back in the Pacific on yet another trip to the Left Coast. I used my wetsuit, although I probably could have gotten away without it. The water was clear and a cool 67 degrees. I could even see fish swimming along the bottom. I only swam for a half hour. My leg injury was bothering me when I kicked and I didn’t want to aggravate it. The conference was a joyful mixture of compelling content mixed with pleasurable activities. During the first day of the conference, the sessions ended early. 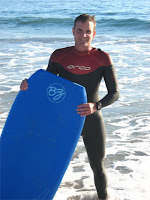 As part of the conference, it was arranged with the hotel for everyone to take surf lessons. Unfortunately, the wave weren’t conducive to surfing, we all wet Boogy Boarding instead. It was a lot of fun. I spent almost 3 hours in the ocean, comfortably in my own wetsuit. Everyone else had to borrow a wetsuit from the hotel. After Boogy Boarding, I then went to the hotel’s lap pool and swam around 2000 yards. The activities for the next night of the conference included dinner followed by an open bar and a Trivia contest. Everyone was broken up into teams of 4 and we played to win a Wii, Ipod and other great prizes. Our team didn’t win anything though, but it was still a lot of fun. That was about it. The conference ended around 12:30pm the next day and then it was time to zip over to the airport. I had an uneventful trip home. While flying I entertained myself with a great book I am reading called “Busting Vegas”. I highly recommend it.